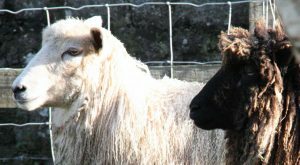 Wool Initiative – Fleeces and Yarns from Rare and Native sheep breeds. The Wool Initiative Company was established in 2001 by a group of Rare Sheep Breeders in Northern Ireland to exploit the unique qualities of the fleeces produced by the diverse breeds of sheep listed as endangered by the Rare Breeds Survival Trust. This created a demand for the wool and enhanced returns for the flock owners. We work with spinners, hand-weavers and felters to produce very special textile pieces from raw and scoured fleece, exquisite yarns and wonderful woven fabrics. Textile artists and crafts-workers source fleeces and yarns of different sheep breeds for particular characteristics. We carry wool from many Rare and Native Breed sheep. These fleeces are soft, lustrous locks and are great spun or felted.